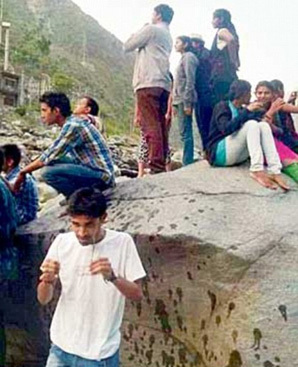 The Beas Tragedy - How many lives is development worth? 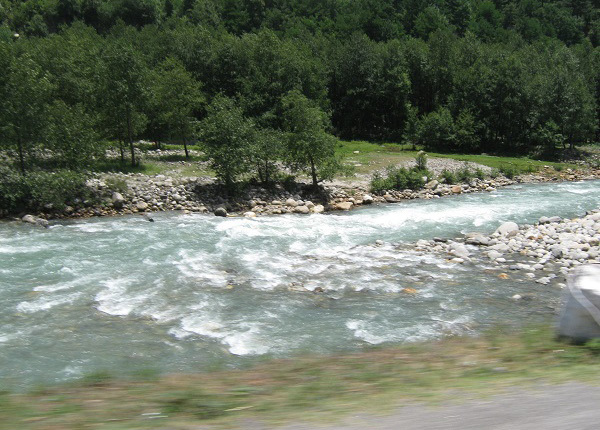 Act 1 Scene 1 Location: Beas River in a mountainous village between Mandi and Kullu. The Himalayan Mountainous Terrain with gorgeous snow-capped peaks, lush green valleys between hills, snaking rivers with their milky and foamy gushing waters, masculine boulders and rocks rising above the river waters and occasional springs and waterfalls and sun and clouds playing hide and seek with bounty of nature. Wow, amazing fun! Ideal and perfect for I wish you were here post card stories. Perfect locale for admirably adventurous travelogue. Romantic for selfies for Facebook and WhatsApp uploads, to be liked by jealous friends. Wild & Untamed is the theme. Be warned: hidden dangers lurking everywhere. Act 1 Scene 2 Location: VNR VignanaJyothi Institute of Engineering and Technology in Hyderabad. Our aspirational young boys and girls in their late teens from rurban lower middle class flock to thousands of these Institutes of Engineering & Technology with campuses located on suburban extensions of large cities or in remote villages near emerging cities. Unlike the parents of my generation, parents of these students believe that grades and pass percentages in secondary school leaving examinations matter more than anything else for success in life. Merit is described in terms of marks and rank obtained in college entrance exams too, in addition. Their dutiful children find no usefulness in acquiring other skills, including swimming, running, trekking, and other adventurous sports. Those who did not make the cut-off grade bought the admission with discreet qualifications like help from influential uncle nepotism, or outright and voluntary donation to the institution often derided by leftists and liberals as capitation fees. This is generic description of our education and campus scene across the country. Young, carefree, unsuspecting crowd with tamed curiosity for learning except mugging, with soft skills of enjoying a day out and chatting online with uploads of smileys and selfies in exotic poses and spots. 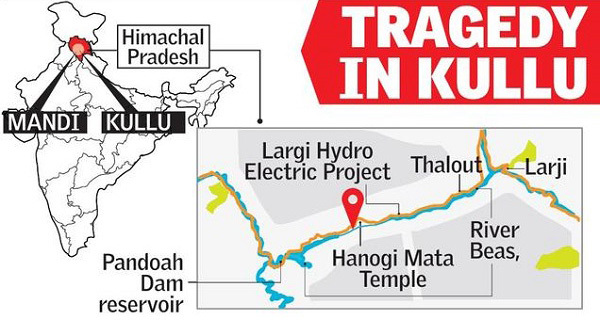 Hydro-electric power is described as least polluting and environmentally damaging method available for us in India to generate our electricity. Unfortunately, the turbines need tons of water flowing into it from an elevated water reservoir and turn the giant gears and rotors. Dams are built on rivers in Act 1 Scene 1 locations to feed the power plants with the raw material input. Act 1 Scene 4 Location:River Bank in a village near Hanogi Mata Temple. In this actors schooled under Act 1 scene 2 are transported into scene 1 unmindful of or ignorant of or unaware of inherent but hidden risks of scene 3 arrive at a location of scene 1. 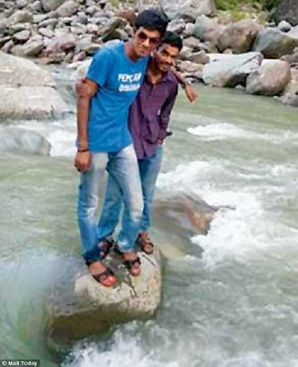 The ill-fated group of engineering students were merrily taking photos on the river banks. They had decided to make an unscheduled stop-over while on their way back from their day-long field study project. Were they returning after their visit to the power plant and its infrastructure? This combination of circumstances is a recipe for disaster. They were washed away in the swirling waters which suddenly rose several feet on Sunday evening. 1. We need tourism to flourish in Scene 1. What is scenic beauty for if we cannot develop tourism and earn mega-bucks? Who among us do not vote for development? Who among us do not want to make money? So, we need to preserve scenic beauty, culture environment and ecology of scene 1 in its virgin and pristine glory and magnificence while getting tourists to shed their money without bringingwith them their alien habits, ignorance, culture and needs. 2. We need to create jobs and employment for our young and aspirational population. We must tap our demographic advantage to economically pole-vault in our rat race against Chinese development machine. We need engineers, technicians and skilled factory hands, not to mention MBA qualified managers to give manufacturing and industry much needed boost. We recently voted out a union government because under its guard our manufacturing sector did not grow and did not generate jobs to those graduating under scene 2 conditions. Did the scene 2 education systems impart life skills necessary for them to operate, maintain and manage industrial installations such as dams, hydro electrical power plants, direct safety & disaster management systems in scene 3 and participate in relief and rescue systems in scene 1? How effective were their faculty in understanding, communicating and responding to the risks in scene 3? How conversant with rules to observe in restricted regions of scene 3 and how much awareness and due respect did he exhibit in conducting his business? 3. HP State Electricity Board (HPSEB) owns and operates the scene 3 infrastructure including the electricity generation, evacuation, and transmission and distribution business. It is state government business involving several of its operational entities, whose managers, engineers and operators are sourced from scene 2 institutions and imbued with unique bureaucratic ways under governmental training and skill development officers. Safety, Health, Environment and Human Life are way down in their list of priorities. Successful CEOs, their operational managers and engineers list increased production, higher process efficiencies and reduction of costs as foremost priorities. Safety & Environment management, Crisis & disaster management, fire & loss to human life are paid lip service in routines like mandatory filling of inspection sheets at audit meetings and patrols. 4. Starting and shutting down generators, varying actual loads of power generation and its evacuation are routine operations performed by round the clock operating personnel guided by their knowledge of standard operating procedures (SOP) and day’s instructions from resident engineer or executive manager. Errors occur due to human failure both due to lack of knowledge, lack of competence, gross negligence and an assortment of systemic fault lines directly related to culture of poor management. This is true not only in Indian government sector enterprises, but also in most privately held industrial complexes. My personal experience abroad, especially in Arab Gulf countries, reinforce my view that money which development brings occupies human consciousness than due regard to human life, body and limb, and overall human safety. That is another story for a later day. 5. What were the victims thinking when they decided to picnic at the spot? Only of instant joy of sight-seeing, clicking pictures and sending them to loved ones. Having a time of their lives, completely unaware of their bizarre fate. Coming from Scene 2, they cannot be blamed for their behaviour. However, their faculty and the tour operator cannot plead like students. Their behaviour at Scene 2 is probably of a routine and daily exhibition of lack of empathy and responsibility towards the young lives that they were grooming to become our future industrial work-force. They proved incompetent to plan and execute field work safely and prevent the tragedy. They will blame everyone else in shrill rhetoric what others should have done without any introspection about their own competence and lack of tour management. We describe it as man-made tragedy. We can name it bizarre. We can beat our chests and throw our hands in despair at our political leaders, our governments, Congress party who ruled longest in independent India and a host of others who should have done a better job. These cries will be drowned out in the din of another new story which is already in the making somewhere without anyone having any clue. After all, we excel in scoring brownie points in debates even as another Bhopal is just waiting to happen even as our development story has got a shot from electoral verdict in its favor. 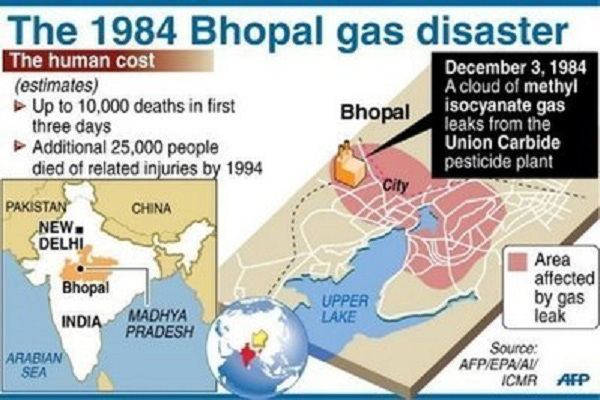 Yesterday, 6 have died, a dozen critical and two dozen injured at Bhilai Steel Plant, one unit belonging to Navaratha SAIL in an industrial accident which is due to human failure to adopt systems to manage safety of operations. We will pay with many more lives, until we learn the value of human life. In 2013, 36 died in Islamic terror in India, 33 due to naxal violence. 150,000, yes one lack fifty thousand died in road accidents. yet, Islamic terror gets eyeballs and agitations. So, even if half a dozen read these articles, they have served social purpose...eyeballs and number of comments are secondary, Victor! Having worked in an Oil company for 25 years both onshore as well as offshore, your write up emotionally upset me. When I joined the company I was not aware of the value of human life. Day by day, after attending regular safety meetings, pre-job briefings, facing threats of dismissals I changed myself to an enlightened person regarding safety and its implementation. Now even in retirement I see danger lurking in every move of mine, whether crossing a road, driving or swimming even though I am an expert swimmer and had undergone water survival courses. In the kitchen I always see danger. Check the gas connection before going to bed. Before starting the car check the tyres etc. etc. etc, the list goes on. Am I paranoid? May be I am. On an outing I carry the First Aid Kit. At a pool side party, sit in a corner and keep an eye on the swimming pool when everyone having fun leaving the kids to fend for themselves. When there is christening party in a "confined space" (that is what many people do to save some money) and the sound system blaring at the highest decibels, I advise the mother to move the infant to a place where there is minimum noise. When I get into a vehicle and try to buckle up, I was told it is not necessary. When I see a young mother, riding a scooter with a three year old kid standing between her legs and another pillion riding without helmets, my heart bleeds. I doubt any one will read your lengthy article except Ronald Sabi, Dr Eugene and a few others. If those who read and benefit from it and pass on the information to others you shall be a satisfied man. Heart breaking tragedy! Cause: Human error. Unfit on the job while responsible heads on deep sleep! Apart from that, stand alone analysis: Tourism and related revenue or employment....a distant dream! Look at country like Thailand...roads are better, garbage is under control due to government regulations. They have a better culture of not throwing garbage at dirty will! We are still struggling to locate modes of garbage disposal solid land fill and other types and lack of location to carry out processing. Usage of treated water for garden and greenery could be a step reserved for an era of third generation from now! And century for improvement on the slums surrounding Mumbai metro tracks (ref: same authorâ€™s pictorial article few days back on this website).